Okay, time for another poll. Today, we would like to hear your feedback on the new iPad, and more specifically, the 4G LTE service that you are getting, assuming that you have opted for 4G service on your iPad, of course. Currently, a Wi-Fi + 4G iPad model can operate on either the AT&T or Verizon 4G LTE networks, and while the former is younger and presumably less congested, the latter has better coverage. But that is just on paper and the real life results may vary for each and every one of you. 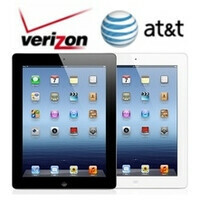 That is why our question for you today is: are you happy with the 4G LTE service on your new iPad? Feel free to cast your vote in the poll below. I am on Verizon and having 4G LTE on my iPad is awesome. I am on Verizon and the speed is so-so. I am on Verizon and I was expecting to see more. I am on AT&T and the 4G LTE speeds on my iPad are amazing. I am on AT&T and the speed is okay. I am on AT&T and I am not impressed. I am on Verizon and having 4G LTE on my iPad is awesome. I am on Verizon and the speed is so-so. I am on Verizon and I was expecting to see more. I am on AT&T and the 4G LTE speeds on my iPad are amazing. I am on AT&T and the speed is okay. I am on AT&T and I am not impressed. I Dont Have An iPad. If you don't have an iPad, then you dont need to be voting!! can u not resist posting on every apple article? I hope AT&T folks are not confusing LTE with HSPA+. Good morning trolls good to see first thing you do when you wake up is read about Apple. We need dedicated closet fans like you.